Pay homage to one of horse racing’s legends in this action packed, top-heavy slot from Playtech. Based primarily around the Italian superstar’s epic win at Ascot in 1996 (he won all seven races), this fond retrospective celebrates a titan at the top of his game. In terms of layout, the slot has five reels, three rows, and up to 25 pay lines. It features a large and appropriate jackpot of 7,777 coins, and has a couple of fun bonus rounds that can be very lucrative. Massive jackpot. Let’s face it this is why we’re playing these games isn’t it? Great feel, looks, and subject matter. Fans of horseracing will enjoy this lookback at a hero of their sport. Huge number of betting combinations. Being able to vary our stake per line, the number of lines, and the value of each coin give a lot of control to the player. Horseracing isn’t for everyone. If that’s the case with you, you’re probably not going to enjoy this one. It’s not exactly light on the references to the sport either. As mentioned the top jackpot for this game is 7,777 coins. This is awarded for five of the symbols featuring a closeup of Frankie’s smiling face (also the “wild”) symbol across a win line. 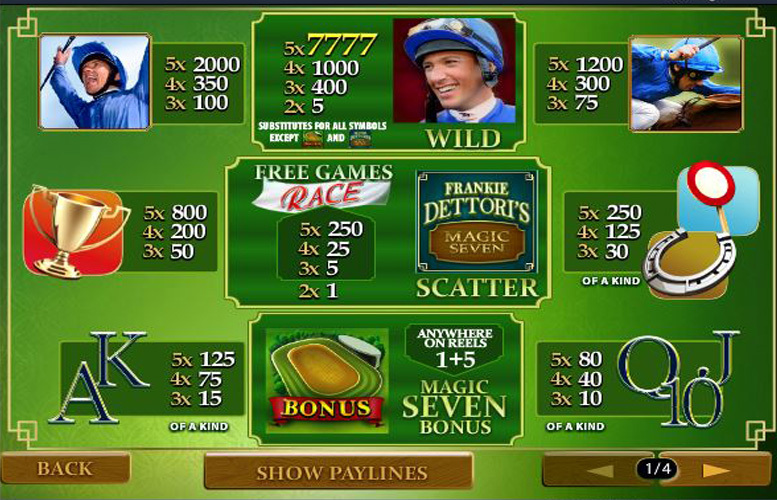 There’s a couple of great bonus rounds in Frankie Dettori’s Magic Seven to help spin your way to riches. They’re inspired by the great afternoon at Champion’s Day, Ascot ’96. To trigger the Magic Seven Bonus, you must land the Bonus symbol on reels one and five simultaneously. The feature is a fancy version of a “pick a box” style game. You’re given an aerial view of the racetrack and must pick sections from it to reveal multipliers on your base win. 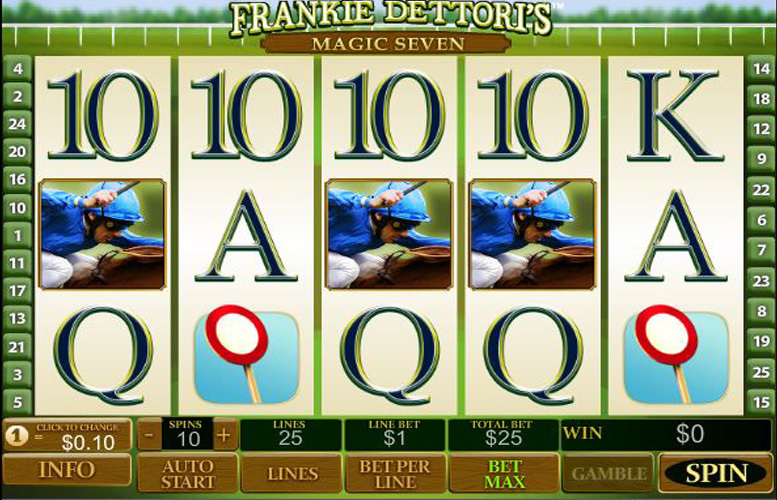 The other bonus is a cross between virtual horse betting, and a traditional free spin round. Here, players are presented with three horses and asked to pick which they think will win in a simulated race. If their horse romps home a winner, they win 25 free spins, second place will award 15, and third wins just ten free spins. Additional wild, and scatter symbols are also added to the reels during free spins. Unfortunately, it is not possible to retrigger the bonus, or play any additional bonus games during the round. In addition to the higher value symbols mentioned, there are also some smaller prizes waiting to be picked up by players. As is somewhat typical on slot machines, these are represented by the upper end of a standard deck of playing cards (A, K, Q, J, 10). Ace, or King = 125 coins. Queen, Jack, or 10 = 80 coins. Certainly, one of the greatest things about this game (apart from its juicy jackpot) is the number of different variations of bets players can experiment with. They can adjust the how many pay lines are active, how many coins are bet per line, and the value of each coin. With everything set to maximum, the largest spin possible is £1,250, and the absolute minimum is just 1p. Of course, players can experiment with all different sizes in between these figures. This lookback at the world of classic horseracing with Dettori as our guide will no doubt be nostalgic for many. Gambling is inextricably linked with horseracing so the marriage of the two, delivered in the medium of a video slot is fitting. The visuals aren’t the sharpest out there, and it might feel a bit dated but for me that just adds to the charm – it would feel very strange if Detorri was featured on a super-slick, ultra-modern machine, anyway wouldn’t it? Granted, horseracing isn’t to everyone’s personal tastes. For those not as partial to watching sentient beasts pummelled around a track, perhaps the massive jackpot will be enough to win them over. This game has a rating of 8 / 5 with 382 total reviews by the users.